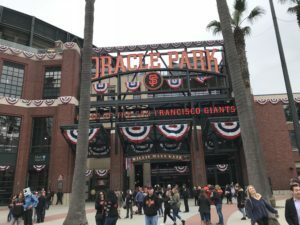 The Giants do ceremonies, tributes, and nostalgia as well as anyone, and yesterday’s epic pregame festivities were a trifecta of poignancy (an emotional Mike Krukow reading the late Peter Magowan’s Wall of Fame speech at Magowan’s request: “Mikey, if I’m not here for it, I want you to read my speech”), respect (the long, loud, and heartfelt ovations for Bruce Bochy), and kindness (Brandon Belt comforting Willie McCovey’s grieving widow as she wept in his arms). In every good way, that was SO the SF Giants. This is the 20th season for this beautiful ballpark, and I still remember my first visit in April, 2000. Just as we did yesterday, we approached the park from Third Street, and that was our first view of it, other than on TV. 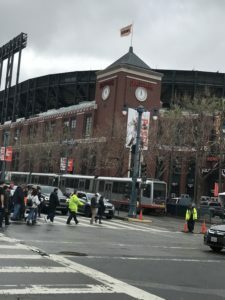 I stopped and took a picture of my first glimpse of the Cathedral in its “Oracle Park” era. It was also interesting to see the new scoreboard finished (it was only partially built during the Bay Bridge series last week). I found the in-game experience of it to be something I’ll have to get used to. It’s so BIG, and there’s a LOT of information, from identifying the batter’s Twitter handle and walk-up song to updated analytics on what the pitcher is throwing. The various media outlets thoroughly covered the various planned tributes and touching moments, and many of you watched them live on TV, so I’m not going to try to add anything to those. Here’s a good recap by the Chronicle’s John Shea and another by Alex Pavlovic. 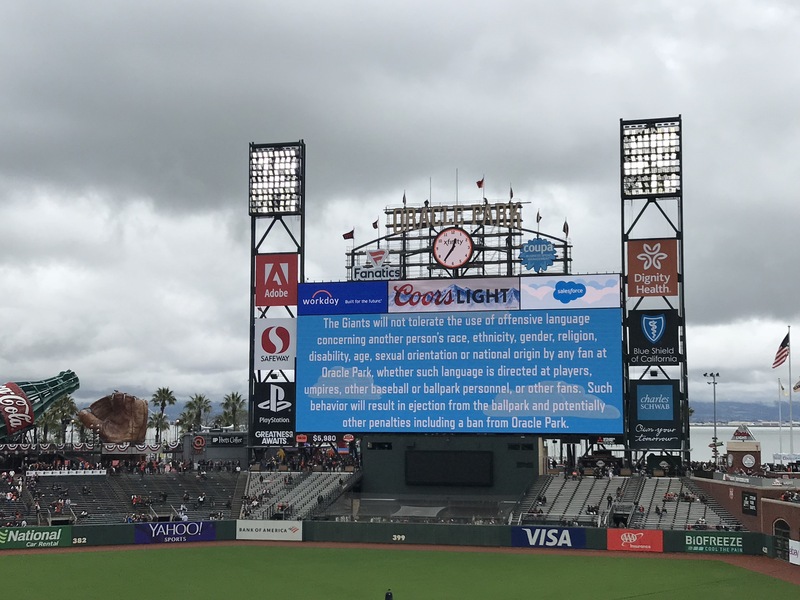 Besides the pregame ceremonies, the Giants also did lovely between-inning video tributes to former Giants manager and Hall of Famer Frank Robinson and beloved Giants broadcaster Hank Greenwald, both of whom also died during the offseason. Bruce Bochy was clearly moved by the lengthy ovation he received when he was announced, which just wouldn’t stop despite Bochy’s gesture to emcee Jon Miller to move it along (Miller ignored him). I thought the Giants did an amazing job on all of it, including great emcee/speech turns from Renel, Miller, and Krukow. 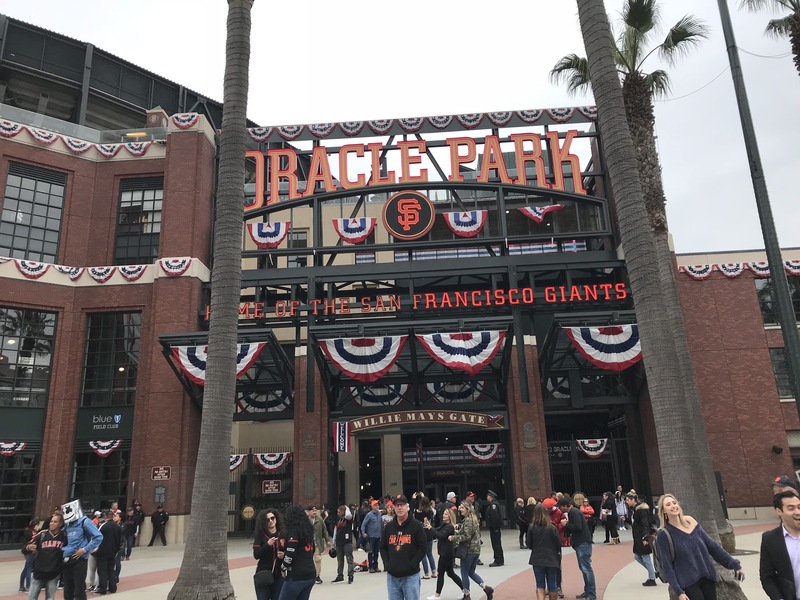 My personal verklempt moment came when the Giants’ non-starters were all announced and Madison Bumgarner came out to a thunderous ovation, maybe–likely?–for the very last time. My heart broke the day in 2015 that Tim Lincecum was helped off the mound after being hit in his pitching arm by a line drive, never to be seen on a mound in a Giants uniform again, and it will shatter into many pieces whenever the last Bumgarner start (July? September?) begins and ends. Other than Bumgarner and Bochy, I’d say the biggest pregame ovation belonged to not Buster Posey, not Brandon Crawford, but…Pablo Sandoval, and he got plenty of love again when he served as Bochy’s catcher as Bochy threw out the first pitch and again when he pinch-hit in the seventh inning and drove in a run. So interesting how Pablo’s story has come full circle with the Giants and their fans. Did all of that emotion and delay throw off Dereck Rodriguez? 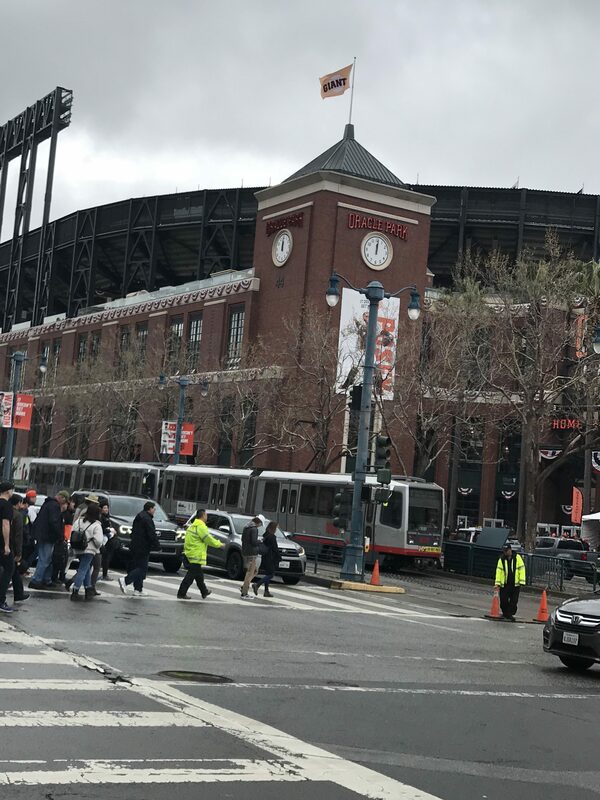 Within 10 minutes of the first pitch, the Giants were in what we all knew was an insurmountable 4-0 hole, and most of the club-level patrons fled to the inside bar area. The pomp and circumstance were over, the game pretty much was, too, and while thankfully not raining, it was chilly and damp for most of the afternoon, with a few cameos by the sun here and there. Rodriguez’s first-inning collapse was particularly shocking in that he got the first two outs easily and had two strikes on each of the next three hitters. Then he really pitched quite well for the next 4.1 innings, so what happened there? It was not only unusual in the moment, but it was also an outlier for D-Rod’s still-young career as a major league starter. In 19 starts last year, he gave up as many as four runs only three times, and he certainly never gave up four runs in the first inning. Now, the Rays’ lineup is no picnic, but the fact that he settled down and had no further damage–and that the Rays only scored one more run in the subsequent eight innings–suggests that something was off for him in the first inning. But the story of the game was less D-Rod’s unfortunate first inning and more the continued ineptitude of the Giants’ offense. For the eighth straight game, they did not score a run in the first three innings (and have only scored in a fourth inning once), and in this one, they didn’t break through until the seventh inning on back-to-back RBI doubles by Sandoval and Steven Duggar (who are really the only two Giants hitting at all in this early season). They showed some grit by bringing the tying run to the plate in the eighth and ninth innings, but they also managed to load the bases with no outs in the eighth innings and not score following a strikeout by Parra and a double-play grounder by Pillar. As Baggarly pointed out in a piece a couple of days ago, we shouldn’t be overly impressed by the Giants’ odd tendency to sleep at the plate for the first 5-6 innings and come to life late. Bochy isn’t impressed by it either, as he’s already had a meeting with the hitters about this very issue. It’s tough to win games when you’re trying to dig out of holes against a team’s bullpen (spoiler: most teams’ bullpens are not as vulnerable as the Dodgers’ seems to be), and maybe more importantly, it puts almost unbearable pressure on your own starting pitchers. Here’s a stat for you. In eight games, the starting pitchers have thrown 42.1 innings and have had a lead in exactly two of those innings. 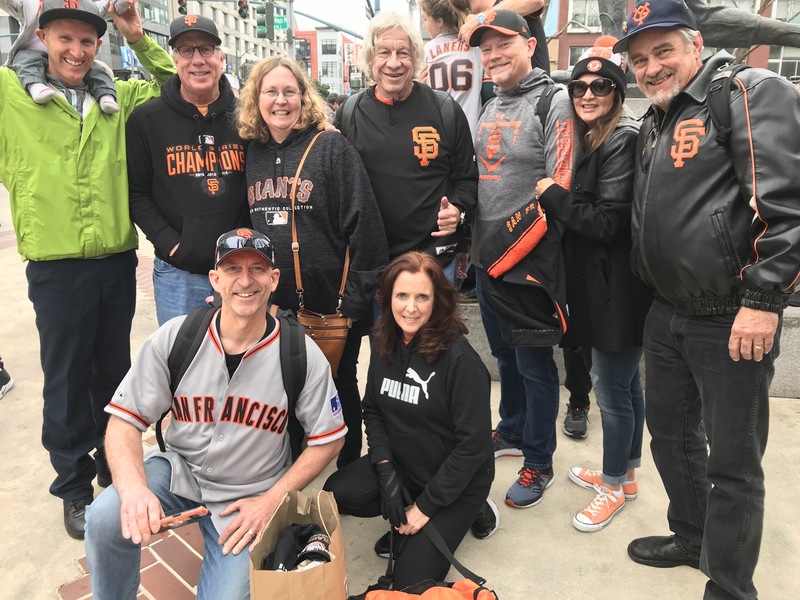 After the game, a bunch of TWGers who’d attended the game met at the Willie Mays statue in front of the park to meet-and-greet and snap a photo. Crawnik shared his in the comments yesterday; here’s one from my camera. I’ll be honest. During the game I turned to MrLefty and said “We may be headed for the #1 draft pick next year.” Later I looked at the standings and saw that there are no fewer than three teams with worse records than the Giants, and one of them is the World Champion Red Sox, and two others that have the same record (2-6) as the Giants so far. So maybe I’m being premature about that #1 pick. But…this isn’t good, folks. The hallmark of a bad team is finding new ways to lose games each day. Just this week we had two of the most reliable starters (Bumgarner and Rodriguez) give up crooked numbers in one disastrous inning, putting the game instantly and permanently out of reach. We had two of the best relievers (Moronta and Watson) cough up a lead (Moronta) and dig a deeper hole (Watson). We had errors lead to unearned runs (Sandoval in Sunday’s game and Bumgarner in Wednesday’s) that ended up being decisive. And pitching and defense are supposed to be the strength of the team this year. But the offense, oh wow, it’s so bad. If you want to, click on the link below the line score at the top of this post and take a look at those batting averages. I’ll warn you, though: It will make your eyes and your brain hurt. Other than Duggar (.273) and Crawford (.259), there is not a single regular hitting even .230. Sandoval is hitting .400, but he mainly pinch-hits. Solarte is hitting .222. Erik Kratz and Connor Joe are still at .000, as was the now-departed-to-Sacramento Michael Reed. More? They have a whopping five (5) team homers, and two of those were hit by guys whom you wouldn’t regularly expect them from (Duggar and Bumgarner). They strike out way too much and they don’t walk. Even OBP guys like Belt and Duggar have only drawn one walk each, Crawford’s drawn zero, and hard-to-strike-out guys Posey and Panik have only two apiece. I could go on. It’s. So. Bad. As you all know, I attended both the road and home openers this year, and I was, in a word, fuming after seeing no-name Rule 5/waiver wire guys in the corner outfield spots in the opener at San Diego. But what’s maybe even more disheartening was that yesterday’s inept offense was made up of nothing but major league veterans, with the exception of near-rookie Steven Duggar. Our own core guys (Belt, Crawford, Posey, Panik), acquired guys (Longoria, Parra, Pillar, Solarte)–all of ’em are experienced major league hitters. And none of them are hitting. What are the odds that ALL of them would slump this badly? Right now the Giants are 2-6 (.250), which means they’re on pace to win..give me a second…40.5 games. To the degree there’s any hope for this season (and by “hope,” I mean “the Giants don’t actually go 40-122”), it’s found in the paragraphs above. These are veteran major league hitters. They have experienced enough success in the past to at least stay in the major leagues (guys like Parra and Solarte and Pillar and Panik) and in some cases have been stars or near-stars (Posey, Longoria, Belt, Crawford). This is not the 2008 lineup. So the offense could get better. And the pitching is good. The Giants are third in team ERA in the NL, and their bullpen leads the league. But the offense needs to give the starting pitchers some support. 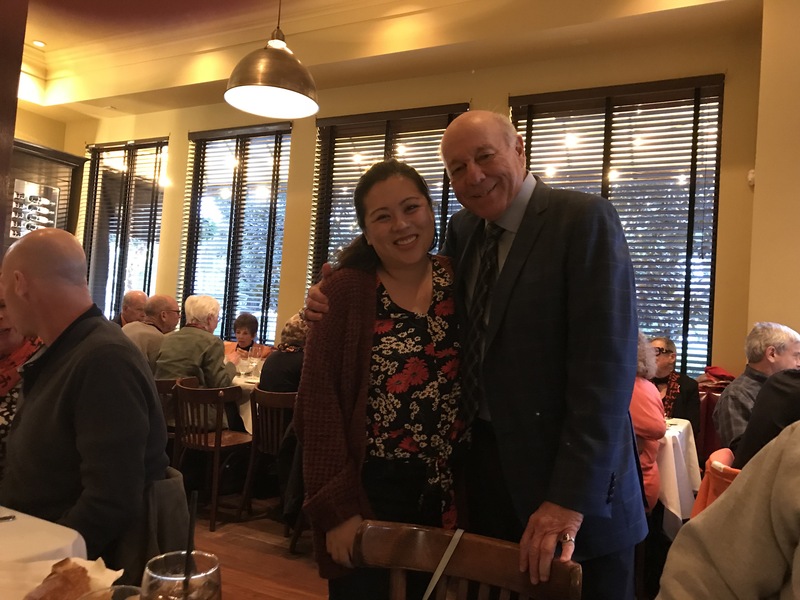 On Thursday night, MrLefty and I attended “Marty Gras,” which is an annual dinner at Original Joe’s in North Beach, where Giants fans have a prix fixe meal and talk about the Giants with Marty Lurie and other fans. We had fun at our table because we were sitting with Carmen Kiew (one of Marty’s sidekicks on his weekend radio shows and now on the “Triple Play” post-postgame show on NBCS-BA with Cole Kuiper and Therese Vinal) and got to chat with her about a wide range of subjects. Also at our table were McCovey Cove Dave (the kayak guy), a couple who work at the park as ushers, and many other lively personalities. The best part was that we spent several solid hours talking intensively with people about all things Giants, not just making awkward chit-chat with total strangers (which was what I had nervously imagined). It’s too bad we don’t have a better season to look forward to, but it was still a good time. I got Marty and Carmen to pose for a picture. Rays at Giants, Oracle Park, 1:05 p.m.
It’s Evan Longoria Bobblehead Day. Why, I’m not sure, but I do think his commercials about his bobblehead are pretty good. This one’s my favorite. We’re headed home to Davis today, but I know SurfMaui and vailsunshine, as well as the Crawniks, will be out there today. The weather looks OK–hope the game is better. Lefty out. Copyright © 2019 Together We're Giants. All Rights Reserved.